The patented device appears to be a new PlayStation Move controller. Sony filed a patent for a "Flat Joystick Controller" in June 2012. 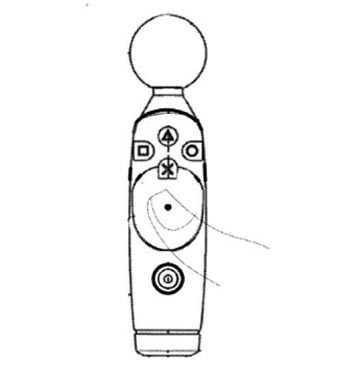 Published earlier this month in Free Patents Online, the patent depicts a controller that looks similar to the PlayStation Move peripheral, but this one has a different button layout and a touch surface. The patent filing states, "a touch surface is disposed on one side of the handle. The touch surface has an indicator that is identified by a surface characteristic on the touch surface. The touch surface provides an area for receiving directionality control in response to interfacing by a finger of a user." Important to note is that PS4's DualShock 4 has a touch pad. The PS4 supports the PlayStation Move, but there has been such little talk of it that there probably won't be many games making use of it. In a traditional joystick, it is hard to keep a user's thumb still while the user provides input by engaging various motions with the joystick. This is due to the fact that in the joystick, the thumb's support moves. However, using a touch input surface, the thumb can be kept still while continuing to provide the user's input by pressing on the input surface. The pressing of the user's finger on the input surface causes friction that is recognized as the user's engagement. Judging by the lack of overall support for PlayStation Move, this controller may never be developed for consumer use.